According to the Oshawa Times from February 25, 1983 Oscar John Moore (1906-1983) was a councilor of Whitby from 1949-1954 and for many years he also served on the Whitby Public Utilities Commission. He was employed by the Ontario Hospital. From 1941-1946 he served in the Royal Army Medical Corps. In later years he was employed by the Attorney General's Department as a court officer in the Whitby court house. Additionally, he was a member of Royal Canadian Legion Branch 112, Whitby, St. Mark's United Church, and Composite Lodge No. 30, AF and AM, Whitby. 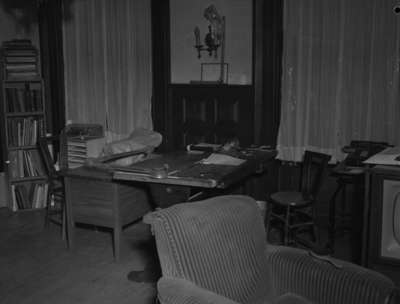 Office of Councillor Oscar Moore, c.1949, Marjorie Ruddy. Whitby Archives A2013_040_1045.